Hive removal and then another swarm??? Jeff is my friend and also my mentor in beekeeping, he also happens to be setup to remove hives from structures. So we arrive on the scene on Wednesday late afternoon to take a look. Well as luck would have it the swarm is gone. The trip is not a total loss however as the hive in the clubhouse seems to be doing just fine without mama bee and 1/2 her children. From the outside it looks to be a small hive built in a box up in the peak of the roof about 18"X18". Jeff assesses that this is going to take about 1/2 a day and should not be too difficult. From my limited perspective on removals, I agree. So after talking to the tenant and then also the homeowner and setup a date to remove the bees. We drive a short distance to arrive at what has to be the most picture perfect swarm ever. 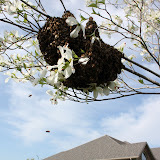 These girls lit on a dogwood tree about 2 feet off the ground; a perfect almost basketball size swarm. 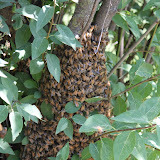 We propped an empty hive body up under the branch and the bees began to investigate. After about 15 minutes we were satisfied that they were finding their new home adequate so we decided to speed the process up a bit. I gave the branch a firm whack and the clump of bees fell onto the open hive body. It was amazing, it looked like someone just poured liquid bees on the hive as they "melted" down into the frames. We put an inner cover on and told the homeowner that we would be back to pick up the hive later in the day after the bees settled in.